Leaders today can operate businesses more sustainably, even in the face of uncertainty from an increasingly interconnected world, if they are prepared. 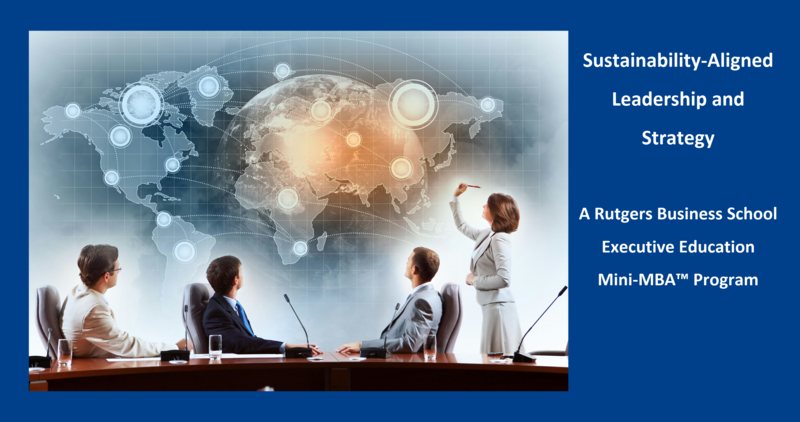 LeaderShip for Sustainability primes executives and managers to mainstream sustainability, with the necessary mindsets, skills, and motivation to lead the way. By building an engaging, inclusive corporate culture, sustainability-focused leaders and companies realize new openings for innovation, competitive advantage, attracting top talent, and invigorating employee commitment and productivity for a thriving, prosperous future. If you want to be a leader who successfully shepherds businesses into a future built on a triple-bottom-line foundation of People-Planet-Profit and would like more information about this leading-edge, customizable program. please contact us at info@transitioningtogreen.com. Jeana Wirtenberg, Transitioning to Green’s CEO, and Associate Professor of Professional Practice at Rutgers Business School, will be presenting on CSR As A Career. 21st Century executives and their teams need the skills, networks, and increased expertise to achieve important CSR, sustainability, environmental, social and community impact goals while delivering value to their organization, investors, and other key stakeholders. This program will give you the knowledge that you need to create impactful change in companies in a way that adds value, improves reputations, increases resiliency, decreases risk, identifies new opportunities, and differentiates to out-compete and out-impact your competitors. The Rutgers Institute for Ethical Leadership, in partnership with the Governance & Accountability Institute, Inc., offers a two-day, deep dive into Corporate Social Responsibility (CSR) and the related fields of philanthropy, sustainability, risk management, and ethics. The certificate program will be presented Tuesday, May 16 and Wednesday, May 17, 2017, 9:00 am to 5:00 pm. On Tuesday evening there is a special networking dinner. In today’s world where uncertainty is more the rule than not, business will need to depend more heavily on the skills, effort, and ingenuity of its individual workers now more than at any other time in the past. This presentation focuses on an arts-based approach that moves participants beyond literal seeing in order to perceive and actualize patterns that spark both ideation and innovation. It has applications both in the sciences (STEaM) as well as in business. Panel: Purpose From Within: What are Today’s Employees Seeking From Companies? Session Description: “We don’t want just a job; we want a purpose!” Employees are looking for impact from their work. They want to thrive; they want to make the company profitable; and they want business to be a force for good in the world. Can they have it all? This panel explores how companies are leveraging this passion within to broaden and deepen the external impact of their social and environmental initiatives.